Ojon is the talk of the town these days. If you haven’t seen them on QVC, then you’ve surely heard other beauty bloggers raving about their products. Ojon’s Damage Reverse Restorative Hair Treatment contains 100% Ojon palm nut oil from the rainforest in Central America. I had received their Dry Recovery 4-piece kit and fell in love with this brand. I simply cannot get enough of that Shampoo & Conditioner! It took me a while to finally get around to trying out the Damage Reverse Restorative Hair Treatment, simply because you need to leave it on for 25 minutes. Tell me when I have 25 minutes to spare when brushing my teeth involves my kids vying for my attention. However, I finally found some me time to use the Restorative Hair Treatment that has been sitting on my counter begging me to use it. It is a small container, but as they say, good things come in small packages. You really don’t need too much of this product to make it work for you. I have pretty long hair, so it took me 3 teaspoons full to fully saturate my hair. You simply scoop some into your hands, rub them together to warm it up, it then becomes more liquid-like and you can smooth it through your hair. Once you’ve smoothed it through your hair with your hands/fingers, you then use a pick to comb through your hair to make sure it is evenly distributed, then let it sit for 25 minutes. After rinsing it out you shampoo and condition as usual. The scent is a little different from the other products. 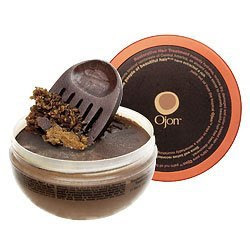 All have a nutty scent to them, but the Restorative Hair Treatment has a nutty fresh ground coffee bean scent. I love coffee, so I didn’t mind the scent at all. I noticed my hair felt soft and managable and brought back a lot of shine. This is a product you would only use once per week as a deep conditioner, although you may be tempted to use it more often because of how marvelous your hair will smell and feel. Have you tried it? Another Ojon product! I’m still loving the Ojon ball! I’d like to try this too for shine. I need shine!